I first encountered Israeli couscous at a local Whole Foods in the prepared food gallery. In fact that same discovery was the inspiration for this dish. In the prepared foods case was a large bowl with a colorful array on orange, red, brown and green against a canvas of the white couscous. This makes a great buffet item as it is tasty warm, cool or room temperature. It lends itself to infinite variations as well. Here is one of my favorites. Preheat oven to 475°F. Line a half-sheet pan with a Silpat or sheet of parchment. In a bowl toss squash with 2 tablespoon olive oil, 1 tsp. salt and black pepper. and spread in 1 layer. Spread on sheet pan into a single layer. Roast in upper third of oven 20 minutes, or until squash is just tender. Transfer to a large bowl. While the squash cooks heat 1 tablespoon olive oil in a non-stick skillet over medium heat. Add the onion, sprinkle with a pinch of salt and cook until tender. Golden brown is OK here. Add to the bowl with the squash. Bring 6 quarts of water to a boil. Add 1 tablespoon kosher salt, return to a boil and add the couscous along with the cinnamon sticks. Cook for ~10 minutes, until the couscous is tender. Drain, shake to remove excess water and add to the bowl with the squash. Remove the cinnamon sticks and discard them. Add lemon peel and juice, parsley, walnuts, dried cranberries to the bowl along with the last tablespoon of olive oil. Toss well to combine. Taste for seasoning and adjust as necessary. Most of the prep time here is in peeling and cubing the squash. I prefer to peel the squash with a chef’s knife. A sturdy U-shaped vegetable peeler will also work. While there are several components to this dish, much of the cooking can be done at the same time. For example, the squash can roast while the onion cooks and pasta boils. 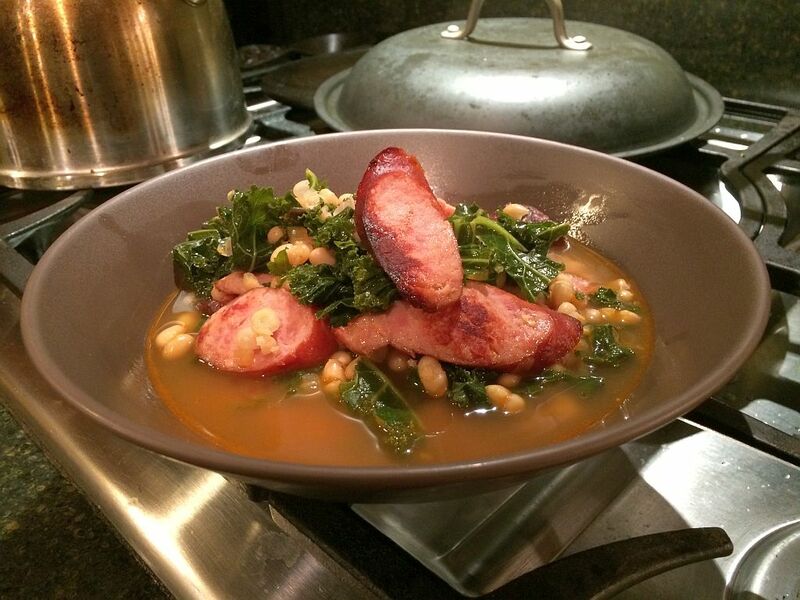 You can make this dish in advance, store it overnight and serve cold, room temperature or reheated in the microwave. Chicken breasts were on sale at Ye Olde Mega Grocery and we had a couple of butternut squashes kicking around. That was enough to start a menu. There are times when I need (or just want) a simple menu that I can pull together with stuff in the pantry. Other than the salad greens this menu qualifies. Weeknight meals can be tough. We both work and arrive home in varying states of tired, grumpy and whiny. An easy to prep, easy to cook recipe goes a long way to making dinner the start of a good evening. 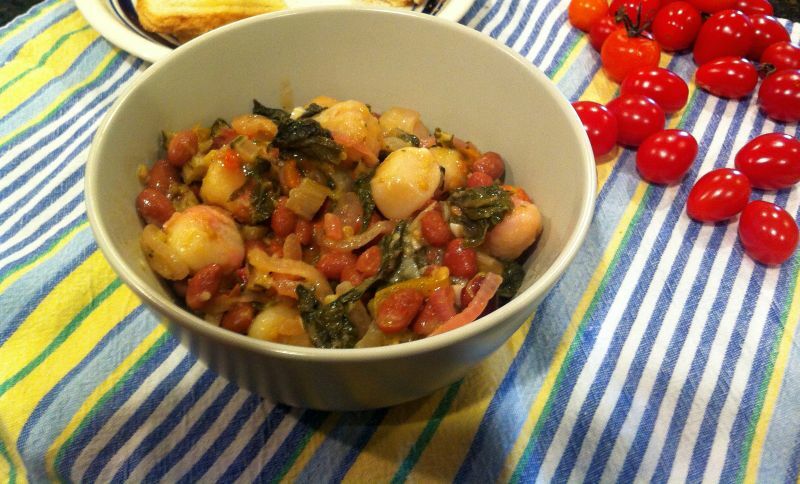 The recipe is based heavily on Skillet Gnocchi with Chard & White Beans. I modified it to fit what we had in the house, added some much needed additional flavoring and wrote it up in my own words. I grew up in a family that always ate leftovers. At least one meal a week was based on the leftovers from Sunday dinner. Roast beef became beef stew. Grilled chicken became chicken salad sandwiches. When I visit my mom I often end up with a meal of odds and ends from the week. A little of this, a little of that, makes a tasty meal. In cooking our big weekly dinners there are often leftovers. Frequently they become lunch and save me from the corporate cafeteria. Sometimes though I decide to work them into a weeknight meal. 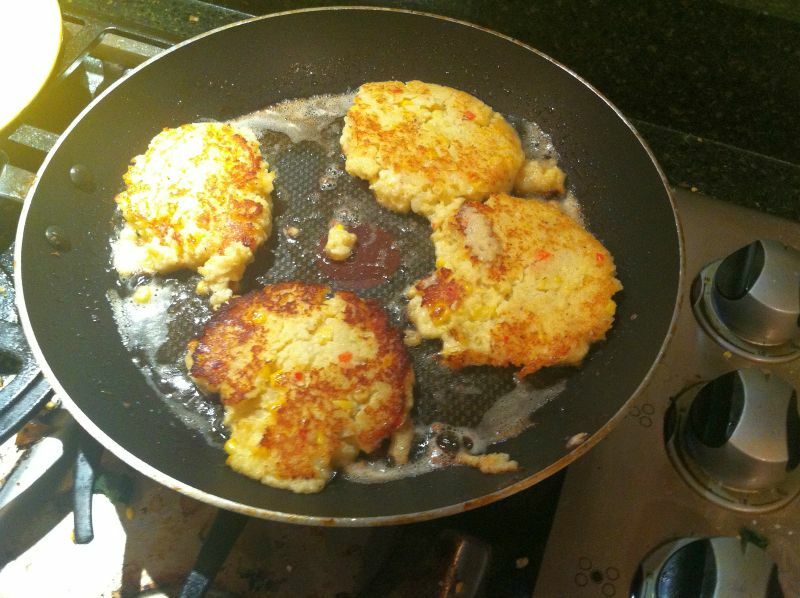 This past weekend we had mashed potatoes and a variation on sauteed corn with leeks. A few ingredients, a hot skillet and tasty side was born to go along with chicken breast. A birthday request inspired part of the meal this week.